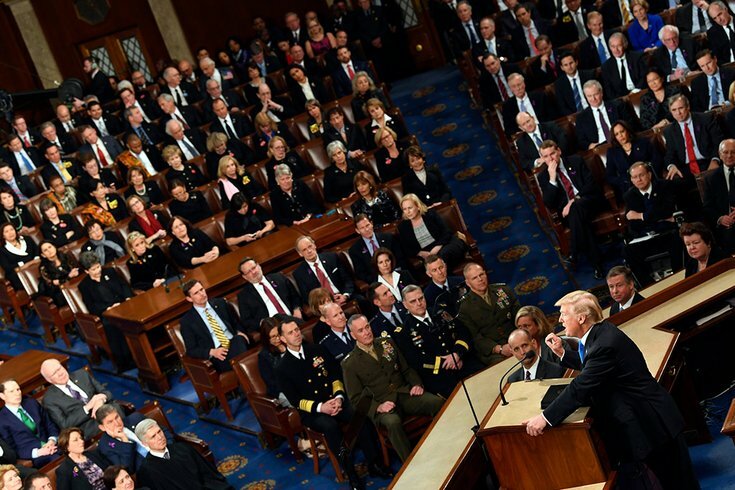 President Donald Trump delivers the State of the Union address from the House chamber of the U.S. Capitol on Tuesday night in Washington, D.C.
Less than 1 year has passed since I first stood at this podium, in this majestic chamber, to speak on behalf of the American People ― and to address their concerns, their hopes, and their dreams. That night, our new Administration had already taken swift action. A new tide of optimism was already sweeping across our land. Each day since, we have gone forward with a clear vision and a righteous mission ― to make America great again for all Americans. Tonight, I call upon all of us to set aside our differences, to seek out common ground, and to summon the unity we need to deliver for the people we were elected to serve. To everyone still recovering in Texas, Florida, Louisiana, Puerto Rico, the Virgin Islands, California, and everywhere else ― we are with you, we love you, and we will pull through together. Some trials over the past year touched this chamber very personally. With us tonight is one of the toughest people ever to serve in this House ― a guy who took a bullet, almost died, and was back to work three and a half months later: the legend from Louisiana, Congressman Steve Scalise. A typical family of four making $75,000 will see their tax bill reduced by $2,000 ― slashing their tax bill in half. This April will be the last time you ever file under the old broken system ― and millions of Americans will have more take-home pay starting next month. We eliminated an especially cruel tax that fell mostly on Americans making less than $50,000 a year ― forcing them to pay tremendous penalties simply because they could not afford government-ordered health plans. We repealed the core of disastrous Obamacare ― the individual mandate is now gone. Here tonight are Steve Staub and Sandy Keplinger of Staub Manufacturing ― a small business in Ohio. They have just finished the best year in their 20-year history. Because of tax reform, they are handing out raises, hiring an additional 14 people, and expanding into the building next door. Since we passed tax cuts, roughly 3 million workers have already gotten tax cut bonuses ― many of them thousands of dollars per worker. Apple has just announced it plans to invest a total of $350 billion in America, and hire another 20,000 workers. So to every citizen watching at home tonight ― no matter where you have been, or where you come from, this is your time. If you work hard, if you believe in yourself, if you believe in America, then you can dream anything, you can be anything, and together, we can achieve anything. 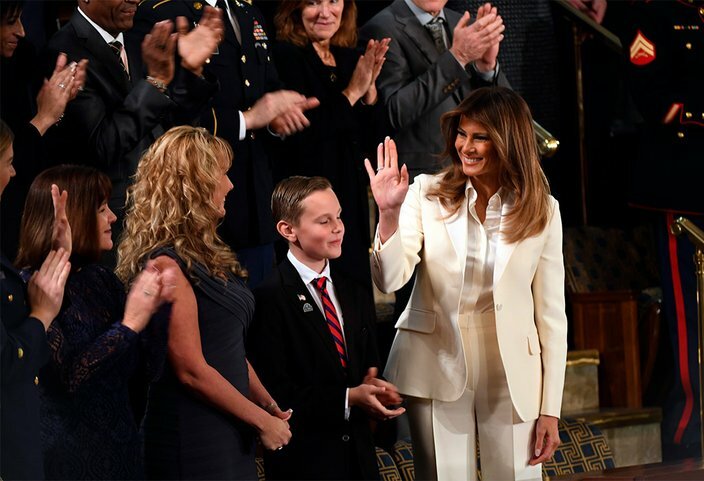 First lady Melania Trump is seen before President Donald Trump delivers the State of the Union address from the House chamber of the U.S. Capitol on Tuesday night. And we are serving our brave veterans, including giving our veterans choice in their healthcare decisions. Last year, the Congress passed, and I signed, the landmark VA Accountability Act. Since its passage, my Administration has already removed more than 1,500 VA employees who failed to give our veterans the care they deserve ― and we are hiring talented people who love our vets as much as we do. All Americans deserve accountability and respect ― and that is what we are giving them. So tonight, I call on the Congress to empower every Cabinet Secretary with the authority to reward good workers ― and to remove Federal employees who undermine the public trust or fail the American people. We have ended the war on American Energy ― and we have ended the war on clean coal. We are now an exporter of energy to the world. In Detroit, I halted Government mandates that crippled America’s autoworkers ― so we can get the Motor City revving its engines once again. Many car companies are now building and expanding plants in the United States ― something we have not seen for decades. Chrysler is moving a major plant from Mexico to Michigan; Toyota and Mazda are opening up a plant in Alabama. Soon, plants will be opening up all over the country. This is all news Americans are unaccustomed to hearing ― for many years, companies and jobs were only leaving us. But now they are coming back. America is a nation of builders. We built the Empire State Building in just 1 year ― is it not a disgrace that it can now take 10 years just to get a permit approved for a simple road? Every Federal dollar should be leveraged by partnering with State and local governments and, where appropriate, tapping into private sector investment ― to permanently fix the infrastructure deficit. Any bill must also streamline the permitting and approval process ― getting it down to no more than two years, and perhaps even one. Here tonight are two fathers and two mothers: Evelyn Rodriguez, Freddy Cuevas, Elizabeth Alvarado, and Robert Mickens. Their two teenage daughters ― Kayla Cuevas and Nisa Mickens ― were close friends on Long Island. But in September 2016, on the eve of Nisa’s 16th Birthday, neither of them came home. These two precious girls were brutally murdered while walking together in their hometown. Six members of the savage gang MS-13 have been charged with Kayla and Nisa’s murders. Many of these gang members took advantage of glaring loopholes in our laws to enter the country as unaccompanied alien minors ‑- and wound up in Kayla and Nisa’s high school. So tonight, I am extending an open hand to work with members of both parties ― Democrats and Republicans ― to protect our citizens of every background, color, religion, and creed. My duty, and the sacred duty of every elected official in this chamber, is to defend Americans ― to protect their safety, their families, their communities, and their right to the American Dream. Because Americans are dreamers too. Here tonight is one leader in the effort to defend our country: Homeland Security Investigations Special Agent Celestino Martinez ― he goes by CJ. CJ served 15 years in the Air Force before becoming an ICE agent and spending the last 15 years fighting gang violence and getting dangerous criminals off our streets. At one point, MS-13 leaders ordered CJ’s murder. But he did not cave to threats or fear. Last May, he commanded an operation to track down gang members on Long Island. His team has arrested nearly 400, including more than 220 from MS-13. In recent months, my Administration has met extensively with both Democrats and Republicans to craft a bipartisan approach to immigration reform. Based on these discussions, we presented the Congress with a detailed proposal that should be supported by both parties as a fair compromise ― one where nobody gets everything they want, but where our country gets the critical reforms it needs. The first pillar of our framework generously offers a path to citizenship for 1.8 million illegal immigrants who were brought here by their parents at a young age ― that covers almost three times more people than the previous administration. Under our plan, those who meet education and work requirements, and show good moral character, will be able to become full citizens of the United States. The third pillar ends the visa lottery ― a program that randomly hands out green cards without any regard for skill, merit, or the safety of American people. It is time to begin moving toward a merit-based immigration system ― one that admits people who are skilled, who want to work, who will contribute to our society, and who will love and respect our country. Most importantly, these four pillars will produce legislation that fulfills my ironclad pledge to sign a bill that puts America first. So let's come together, set politics aside, and finally get the job done. My Administration is committed to fighting the drug epidemic and helping get treatment for those in need. The struggle will be long and difficult ― but, as Americans always do, we will prevail. In that moment, Ryan said he felt God speak to him: “You will do it ― because you can.” He took out a picture of his wife and their four kids. Then, he went home to tell his wife Rebecca. In an instant, she agreed to adopt. The Holets named their new daughter Hope. Ryan and Rebecca: You embody the goodness of our Nation. Thank you. In the past, we have foolishly released hundreds of dangerous terrorists, only to meet them again on the battlefield ― including the ISIS leader, al-Baghdadi. I am also asking the Congress to ensure that, in the fight against ISIS and al-Qa’ida, we continue to have all necessary power to detain terrorists ― wherever we chase them down. Otto Warmbier was a hardworking student at the University of Virginia. On his way to study abroad in Asia, Otto joined a tour to North Korea. At its conclusion, this wonderful young man was arrested and charged with crimes against the state. After a shameful trial, the dictatorship sentenced Otto to 15 years of hard labor, before returning him to America last June ― horribly injured and on the verge of death. He passed away just days after his return. Otto’s Parents, Fred and Cindy Warmbier, are with us tonight ― along with Otto’s brother and sister, Austin and Greta. You are powerful witnesses to a menace that threatens our world, and your strength inspires us all. Tonight, we pledge to honor Otto’s memory with American resolve. In 1996, Seong-ho was a starving boy in North Korea. One day, he tried to steal coal from a railroad car to barter for a few scraps of food. In the process, he passed out on the train tracks, exhausted from hunger. He woke up as a train ran over his limbs. He then endured multiple amputations without anything to dull the pain. His brother and sister gave what little food they had to help him recover and ate dirt themselves ― permanently stunting their own growth. Later, he was tortured by North Korean authorities after returning from a brief visit to China. His tormentors wanted to know if he had met any Christians. He had ― and he resolved to be free. Monuments to Washington and Jefferson ― to Lincoln and King. Memorials to the heroes of Yorktown and Saratoga ― to young Americans who shed their blood on the shores of Normandy, and the fields beyond. And others, who went down in the waters of the Pacific and the skies over Asia. A people whose heroes live not only in the past, but all around us ― defending hope, pride, and the American way.